Forward-ME is a group of UK charities and voluntary organisations convened by the Countess of Mar, in order to promote effective joint working by M.E. and CFS organisations. The organisations are ME Association, ME Research UK, Action for M.E., Tymes Trust, reMEmber CFS, Blue Ribbon Awareness of ME (BRAME), ME Trust, the 25% ME Group, and Invest in ME. The Forward-ME Group has responded to the latest proposals to update the classification of M.E. and CFS in the World Health Organisation’s next version of the International Classification of Diseases (ICD-11). Implicit in their comments below is recognition of the huge amount of work put into this project by ME/CFS advocates Suzy Chapman and Mary Dimmock. We are in agreement that, as proposed here, it is particularly important for Myalgic encephalomyelitis (M.E.) and Postviral fatigue syndrome – presently classified in the Chapter on Diseases of the nervous system [at G93.3] – to be retained in that chapter of the forthcoming ICD-11. Along with commending the proposal’s intention to highlight and reinforce the severe and devastating impact of M.E., we would like to draw attention to the body of scientific material referred to in the rationale for the proposal [Rationale point 1: Scientific evidence that exists for neurological dysfunction; Rationale point 2: Recent federal agency reviews and scientific evidence]. This reflects growing evidence of neurological, immunological and endocrinological dysfunction and related biomarkers. However, we agree that current scientific evidence of neurological impairment and WHO/ICD Revision’s position on precedence [i.e. “legacy should trump with regard to the question of moving certain conditions to new chapters”] supports retention of chronic fatigue syndrome and myalgic encephalomyelitis in Diseases of the nervous system. We support the proposal to move Postviral fatigue syndrome to a synonym under the Concept Title ‘Myalgic encephalomyelitis’. This recognises that not all instances of M.E. may result from a viral infection. We also agree with the proposed removal of the word ‘benign’ from the M.E. title, in keeping with the considerable medical complexity of this condition and its severe and lasting impact on patients. CFS is listed in the WHO ICD-10 index only. It is indexed to G93.3. Yet in practice the label ‘CFS’ is applied variably – both in research (with a multiplicity of definitions in use) and clinically. Given the placement of ‘Fatigue syndrome’ in the WHO ICD-10 Mental and behavioural chapter [as a synonym under ‘Neurasthenia’ at F48.0], it was all but inevitable that the introduction of the term ‘Chronic fatigue syndrome’ to apply to a physical illness would cause confusion. The confusion has a considerable impact on patients. For example, we are aware that some patients are being referred to services for ‘medically unexplained symptoms’, under the mistaken assumption that M.E. is a ‘functional somatic syndrome’. Indeed, the Joint Commissioning Panel for Mental Health (England) has recently published guidance stating that ‘Chronic Fatigue Syndrome/Myalgic Encephalomyelitis’ is a ‘functional somatic syndrome’ [Guidance for commissioners of services for people with medically unexplained symptoms 2017]. As the evidence gathered by this proposal so clearly demonstrates, this illness is a “serious, chronic, complex, and multisystem disease” that causes significant impairment – including neurological, cognitive, immunological, autonomic and energy metabolism disorder. We consider that it is vital that the WHO ICD continues to provide a bulwark against medical mismanagement of M.E. patients. In this regard securing appropriate exclusions is vital, and we endorse the proposal’s recommendations, as set out at Note 4. In particular, we note that the ICD revision intends that the F48.0 Neurasthenia category [where ‘Fatigue syndrome’ presently appears], together with almost all of the present F45 somatoform disorder categories, be subsumed in a single new category – currently suggested name ‘Bodily distress disorder’. We agree that there needs to be reciprocal exclusions for M.E. and for CFS for the ‘Bodily distress disorder’ category. We also agree that reciprocal exclusions for M.E. and for CFS for the category ‘Fatigue’ [previously ‘Malaise and fatigue’] are essential. To ensure that the ICD-10 G93.3 legacy categories are present and appropriately classified in ICD-11, U.S. advocate Mary Dimmock and I submitted a formal and fully referenced proposal on March 27, 2017. Q1: Your proposal for ICD-11 does not recommend retiring CFS. Why is that? Q2: Are PVFS, (Benign) ME and CFS classified the same across all versions of ICD-10? Q3: How is ICD Revision proposing to classify the G93.3 legacy terms? Q4: Is there any proposal to classify the terms under Mental or behavioural disorders? Q5: Will ICD-11 look and function differently to ICD-10? Q6: What is the implementation date for ICD-11? Q7: Is ICD-11’s “Bodily distress disorder” the same as Fink’s “Bodily distress syndrome”? Q8: Where can I view the Beta draft and comment on your proposal? that PVFS is not an appropriate title term for ME to sit under (not all cases of ME are preceded by a virus). that the designation “Benign” should be dropped for ICD-11. In order to view our Proposal in the Beta “Proposal Mechanism” you will first need to register with the Beta platform (this only takes a minute or two and you can register, if you wish, using an existing social media, Yahoo, Google or MS account). We’re inviting patient and advocacy organizations and other stakeholders to review and comment on our Proposal. 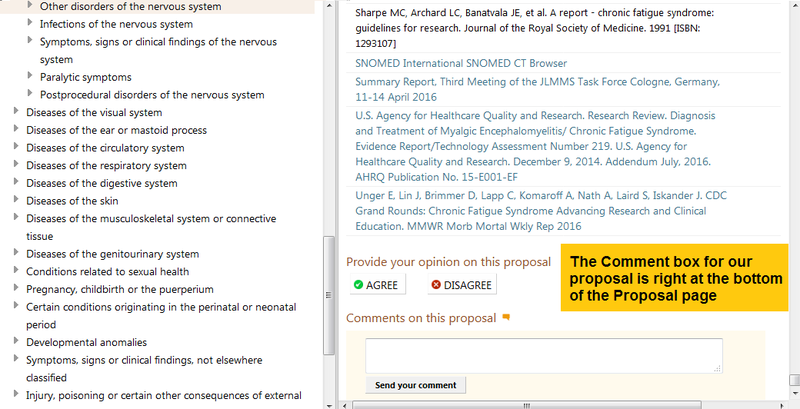 Comments will only be accepted via the Beta “Proposal Mechanism” – so don’t send comments directly to ICD Revision. You won’t be able to edit or delete your comment once it’s been submitted ‒ so you may want to prepare a draft, first. You can include references to papers, reports etc in support of your comments but you won’t be able to upload files ‒ and it’s a plain text field only. At the moment, it’s not clear what date comments on proposals will need to be received by in order to be taken into consideration for the version of ICD-11 that is scheduled for release in 2018. But we are recommending that comments are submitted within the next couple of weeks. If you have an queries please contact Suzy Chapman via the Contact Form. As scheduled, ICD Revision posted a Frozen Release of the ICD-11 Beta draft today, April 4, 2017. This is a stable version of the draft for use by the centres that are signed up for field testing the Beta draft for utility. There is no change to these terms in the Frozen Release compared with how they had stood on March 26, when the three terms were finally restored to the Beta draft. NB: My proposal of December 30, 2014 for an exclusion for the concept title “Postviral fatigue syndrome” was not approved and implemented on March 26, when PVFS’s two inclusion terms were approved. I have queried the rationale for this apparent anomaly with “Team WHO” but have yet to receive any response. The next edition of ICD (ICD-11) is scheduled for release at some point in 2018, following presentation at the World Health Assembly (WHA), in May 2018. The WHO work group with responsibility for the G93.3 legacy categories removed the terms from the publicly accessible version of the ICD-11 Beta draft, in early 2013, while they deliberated over how these categories should be represented in ICD-11. On March 26, after a four year absence from the draft, “Team WHO” finally restored the G93.3 terms to the Beta platform. Two long standing proposals for inserting exclusions under Fatigue for Benign myalgic encephalomyelitis and Chronic fatigue syndrome were also approved on March 26. This suggests that we should view this as a “placeholder” and that the Topic Advisory Group for Neurology may release revised proposals later this year. WHO has confirmed there is no intention to classify the terms under the Mental or behavioural disorders chapter or under the Symptoms, signs chapter. How does the draft currently stand? All three terms are currently back under the Neurology chapter, under parent: Other disorders of the nervous system, with PVFS as the lead (or concept title) term. BME and CFS are specified as inclusion terms (so they are coded to the same code as PVFS). All other content on the listing is much as it had stood in the Beta, in 2009. In view of the caveat, it remains unclear what Topic Advisory Group for Neurology might still be considering for these terms, when they will reach consensus, or whether alternative proposals might be released at some point. There was a proposals deadline on Thursday, March 30. Proposals received after this date may have to wait until after the ICD-11 is tested and released to be considered for inclusion in the first annual update of ICD-11, in 2019. To ensure that these terms are present and appropriately classified in ICD-11, U.S. advocate Mary Dimmock and I have collaborated on the preparation of a proposal for the restructure of the ICD-10 G93.3 category terms: Postviral fatigue syndrome; Benign myalgic encephalomyelitis; and Chronic fatigue syndrome. We submitted a formal and fully referenced proposal on March 27. The World Health Organization (WHO) has been revising ICD-10 since 2007. After several shifts in the timeline, WHO plans to present a version of the next edition (ICD-11 MMS) at the World Health Assembly (WHA), in May 2018.
WHO won’t be seeking endorsement of the ICD-11 product in May 2018 because it won’t be ready to implement. Endorsement will be sought at some point in the future. In the meantime, a version of ICD-11 is scheduled for release later in 2018, after the May assembly. The release date has yet to be announced. Member states will transition from ICD-10 to the new edition at their own pace. It’s going to be several years before countries have evaluated the ICD-11 product for utility and prepared their health systems to make the transition. At some point, data using codes from the new edition will be accepted alongside data compiled using ICD-10. WHO will continue to support ICD-10 until the majority of member states have adopted and implemented the new edition. It will take even longer for countries like the U.S. and Canada, who use a country specific adaptation of ICD, to implement as they will need to modify the new edition to suit their countries’ health systems. The earliest Canada can implement is currently projected as 2023 . The U.S.’s CDC estimate it will take at least 6 years after the codes have been ratified to prepare, field test and implement an ICD-11-CM/PCS. The deadline in order for proposals to be considered for a frozen version in March/April 2017 was 30 December 2016. In order for proposals to be considered for inclusion in the version of ICD-11 that is scheduled for release in 2018, they needed to be submitted by March 30, 2017. So those two deadlines have been reached. Comments by member states and improvements arising as a part of the Quality Assurance mechanism will be included with deadlines later in 2017. According to Slide #12 in this November 2016 WHO presentation, the deadline for member state comments is May 31, 2017; the deadline for Field Testing and Quality Assurance is June 30, 2017 . But these dates are unconfirmed and may have been revised since November, last year. Proposals received after the end of May will be considered in the context of ICD-11 maintenance after 2018, when the new version will be subject to an annual update and maintenance schedule . The first annual update is anticipated in 2019. The Joint Task Force is considering naming each year’s iteration in the format: ICD 2018; ICD 2019; ICD 2020 and so on. There may never be a need for an ICD-12, since an electronic system is better able to evolve “gracefully” – as Dr Christopher Chute (Joint Task Force; Chair, Revision Steering Group) puts it – in response to advances in scientific knowledge and classificatory changes. I have asked Dr Jakob and the Joint Task Force to clarify by what date comments on proposals that met the March 30 deadline will need to be submitted by in order to be considered in the context of the earliest release of ICD-11, in 2018. No clarification has been forthcoming; so if you are a stakeholder considering submitting a comment on existing proposals in the Beta draft or on outstanding proposals queued in the “Proposals Mechanism” which are still going through the review process, then I would advise that you put this in hand over the next couple of weeks. If any deadline is announced, I will update at the top of this report. On April 4, ICD Revision is scheduled to release a frozen version of ICD-11 MMS for field testing*. If there are any changes in this April 2017 Frozen Release that are relevant to stakeholders in the G93.3 terms, I will post an update at the top of this report. The ICD-10 G93.3 legacy categories: Postviral fatigue syndrome; Benign myalgic encephalomyelitis and Chronic fatigue syndrome were taken out of the public version of the Beta draft in early 2013, with no explanation for their absence. ICD Revision has maintained a cephalopodic grip on its intentions for these terms. Advocates and patient organization stakeholders have been attempting to obtain transparency from ICD Revision around the Topic Advisory Group for Neurology’s proposals for these terms for over four years. During this period, stakeholders have been disenfranchised from participation in the revision process. 15 international stakeholder organizations wrote to the ICD-11 MMS Joint Task Force, in February, in support of my call that the Joint Task Force place the matter of the continued absence of proposals for these terms on the Agenda of their February 20–22 meeting, in Cologne. There were asked to expedite the release of proposals for public scrutiny and comment before the March 30 deadline. This initiative was met with a disturbing level of obfuscation on the part of WHO and the Joint Task Force, especially given that ICD Revision has been promoted as an open, transparent process, inclusive of stakeholder participation. The Countess of Mar, a long standing advocate for patients with ME and CFS, tabled two Written Questions in the House of Lords. The first is here (February 27), which received a response that raised more questions than it answered and a follow up question, here (March 16), which received an equally opaque reply. This suggests that we should view the restoration of the terms as a “placeholder” and that the work group may release revised proposals later this year. WHO has confirmed that there is no intention to classify the ICD-10 G93.3 legacy terms under the Mental or behavioural disorders chapter or under the Symptoms, signs chapter. “Team WHO” has also approved some long standing proposals for exclusions for two of these terms under Fatigue (but not yet approved an exclusion for Postviral fatigue syndrome and I have asked “Team WHO” for the rationale for this apparent anomaly, since one would anticipate that if the inclusion terms are excluded under Fatigue, the ICD concept title entity would also be excluded). 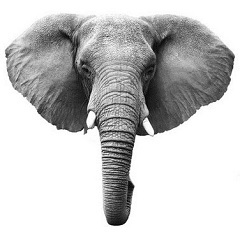 Possibly, TAG Neurology has other plans for the classification of PVFS in ICD-11. So, nearly 10 years into the revision process, it’s still unclear what the work group might be considering for these terms, when they will reach consensus, or whether alternative proposals might be released on April 4, when a frozen version of ICD-11 is scheduled for release for field testing. How do the terms currently stand in ICD-10? For ICD-10, Postviral fatigue syndrome (PVFS) is the lead (or concept title) term. Benign myalgic encephalomyelitis is the inclusion term under PVFS and takes the G93.3 code. Chronic fatigue syndrome is listed only in the Index, and coded to G93.3. How do the terms stand in ICD-11 Beta draft, now they have been restored? Since March 26, 2017, for ICD-11 Beta draft, all three terms are currently back under the Neurology chapter, under parent: Other disorders of the nervous system. PVFS is the lead (or concept title) term. BME and CFS are both specified as inclusion terms to PVFS, in the ICD-11 equivalent of the Tabular List. The terms listed under synonyms and all other “Content Model” descriptive content appear much as the Beta had stood in 2009. But given the caveat, it is still unknown what the work group might be considering for these terms or whether or when they might release further proposals. Note that the recommendations of the various external work groups are advisory only. WHO classification experts and the Joint Task Joint can, and sometimes do, overrule work group decisions. If the Topic Advisory Group for Neurology, that has responsibility for these terms, were to reach consensus and release an alternative set of proposals before 2018, these will not necessarily obtain the approval of WHO/Joint Task Joint. To address this situation, U.S. advocate, Mary Dimmock, and I have collaborated on the preparation of a formal and fully referenced proposal which we submitted on March 27. Our proposal (in the PDF below) recommends that these terms should be retained in the neurological chapter, using separate codes for ME and CFS, and also makes other recommendations. Eight years into the revision process and stakeholders still don’t know how ICD Revision proposes to classify the ICD-10 G93.3 legacy terms for ICD-11. In ICD-10, the (G93.3) Title term is Postviral fatigue syndrome; Benign myalgic encephalomyelitis is the Inclusion term under G93.3; Chronic fatigue syndrome is included in the Index only, and indexed to the G93.3 code . By 2012, the public version of the ICD-11 Beta draft had the three terms listed as in the screenshot, below – still under the Diseases of the nervous system chapter, but with a change of relationship between the three terms. 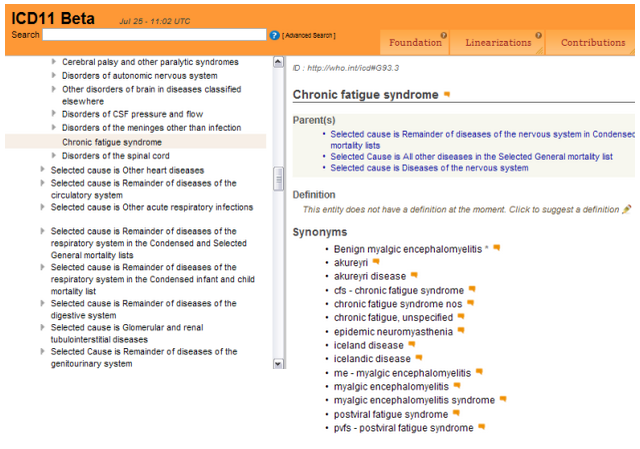 At that point, Chronic fatigue syndrome was being proposed as a new ICD Title term; Benign myalgic encephalomyelitis* was specified as the Inclusion term (indicated in the draft by hover text over the asterisk which is not displaying in this screenshot). Postviral fatigue syndrome, previously designated as Title code in ICD-10, was now located under Synonyms, in a list of alternative and historical terms imported from other terminology systems and health informatics sources, including two terms specific to Chapter 18: Symptoms, signs etc. of the U.S. ICD-10-CM clinical modification . Source: ICD-11 Beta drafting platform, public version, July 25, 2012. 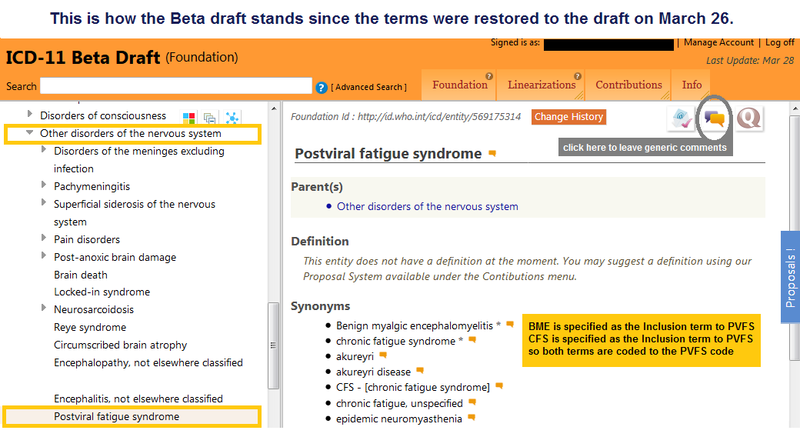 In early 2013, ICD Revision removed the entry for Chronic fatigue syndrome and its associated terms from the public version of the Beta draft; from that point on, none of the terms were accessible in any Linearization. Although a Change History function was incorporated into the public Beta in March, no Change History is available for these terms. The Topic Advisory Group (TAG) for Neurology has published no progress reports on emerging proposals for scrutiny and discussion. So for over 2 years, now, stakeholders have been unable to monitor evolving proposals for the classification of these G93.3 legacy entities within ICD-11. The continued absence of these terms hinders submission of comments and suggestions on proposed chapter location(s), parent classes, hierarchies, inclusions, exclusions, definitions or other Content Model descriptive text. On Friday, June 19, Anneke Schmider (WHO Technical Officer, ICD Revision Project Manager) facilitated a conference call with myself and Dr Robert Jakob (WHO ICD classifications, ICD Revision Steering Group) in which Dr Jakob responded to my letter, having obtained a progress report from TAG Neurology. NB: It was not the purpose of this discussion to advance my own views on how these terms should be represented within ICD-11 but to elicit clarifications on the current status of proposals. • TAG Neurology retains responsibility for these three terms. 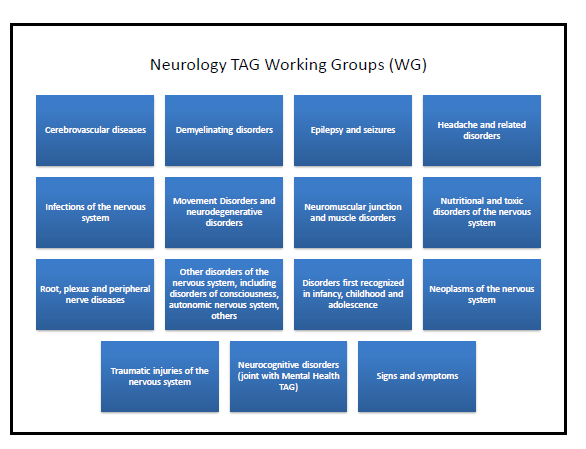 • None of the sub-working groups that sit under TAG Neurology has specific responsibility for these terms. • TAG Neurology is still reviewing the literature and has yet to reach consensus about where to classify these terms within ICD-11. 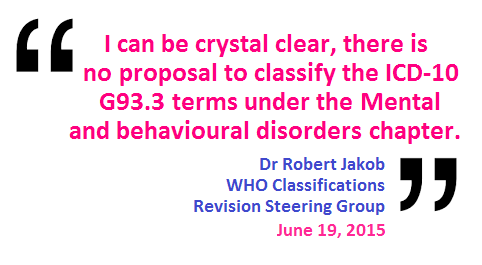 • Dr Jakob says he can be “crystal clear” that there is no proposal to classify the ICD-10 G93.3 legacy terms under the Mental and behavioural disorders chapter. • whether any changes in the relationship between the three terms, as they had stood in the Beta draft in early 2013, have already been agreed or remain under consideration (ie any changes to which of the terms are identified as ICD Title terms, which are specified as Inclusion terms and which are listed as Synonyms). • which of the terms are proposed to be assigned a Definition and other Content Model descriptive text and where definition(s) would be sourced from. It remains unclarified, therefore, whether ICD-11 intends to define CFS discretely from BME. Also unclarified: whether exclusions for these terms are proposed to be inserted under categories such as Bodily distress disorder; Fatigue [previously Malaise and fatigue in ICD-10]; and a proposed new Diseases of the nervous system parent term, Functional clinical forms of the nervous system (a proposal that TAG Mental Health opposes). I have already submitted requests via the Proposal Mechanism that PVFS, BME and CFS are inserted under Exclusions to Bodily distress disorder, and Fatigue. • Dr Jakob says that in September 2015, ICD Revision plans to post various materials relating to the development process on the WHO/ICD website for public scrutiny, this to possibly include rationales, and documents relating to the abridged Primary Care version of ICD-11. • If TAG Neurology’s proposals for the G93.3 legacy terms are not ready for September release, then Dr Jakob projected their release towards the end of December 2015. • The target date for presentation of ICD-11 for World Health Assembly (WHA) approval is currently proposed for May 2018. There would be a period for public review and comment prior to presentation for adoption. I will update on the status of proposals for these terms as soon as further information becomes available. It is regrettable that stakeholders are little better informed than they were two years ago. My longstanding concerns regarding the proposals of the WHO Working Group on Somatic Distress and Dissociative Disorders (S3DWG) for the revision of the ICD-10 Somatoform disorders and the alternative proposals of the ICD-11 Primary Care Consultation Group (PCCG) were beyond the scope of my letter to Dr Üstün and my discussions with Dr Jakob in response to that letter. However, I advised Dr Jakob that my concerns around proposals for the S3DWG’s “Bodily distress disorder” and the Primary Care Consultation Group’s “Bodily stress syndrome” have been discussed with ICD Revision’s, Dr Geoffrey Reed, and in formal submissions via the Proposals Mechanism and Beta Comment facility for the consideration of TAG Mental Health . 6 Personal correspondence; ICD-11 Beta Proposal Mechanism.